The one thing every dinner party needs. I love having friends over for dinner and we have just moved into THE PERFECT house for entertaining. When it comes to dinner parties one of the hardest parts is deciding what food to serve and thanks to Australia’s obsession with cooking shows the bar has been set really high. I have my crowd-pleasers like spaghetti, marinated chicken…a couple of salads, a dessert that includes chocolate and we’re all set. But what about the soundtrack? Ever good dinner party needs a good soundtrack. The music is just as important as the food as far as I’m concerned. 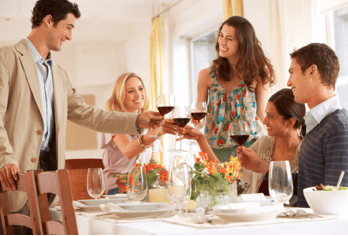 The music can make or break a dinner party. The soundtrack for your next dinner party is Momentum by Jamie Cullum. Listening to it immediately shifts you from ‘insane worker bee’ to ‘relaxed dinner guest’. It’s that effective. You’ll put it on rotate and it will play five or six times that night and you’ll not only ask what it is, but you will buy it, I guarantee it. My husband usually makes reasonably good choices but every now and then a polarising album is selected (no, we don’t all like Rick Springfield). Richard Marx is okay. Compilation albums usually change the mood too abruptly. We usually settle on something understated and classy which is why we own quite a bit of jazz. When it comes to jazz artists it can very quickly become overkill if you choose an insanely popular, overplayed artist. It’s like you’re trying to force the atmosphere. What you need is a jazz album that many of your guests can’t name off the top of their heads. It’ll sound familiar and they’ll enjoy it. They’ll ask, “What is this album?” and you’ll tell them it’s Momentum by Jamie Cullum. They’ll buy it the next day. Jamie Cullum is one of the breakout stars of the jazz world and this album crosses over nicely into a pop vibe that leaves you feeling relaxed and happy. I never like comparing artists to other artists in an effort to describe them so I won’t (although the temptation is there). How about this? Have a listen and you tell me. It’s as clear as day. Jamie Cullum is the real deal. Jamie Cullum’s latest album is out on May 24 so invite your friends over, cook up a storm and press play. Trust me, this is THE album for your next dinner party and for any time you feel the need to just chill. This post is sponsored by Universal Music. Comments on this post are just for this post. If you want to talk about the IDEA of sponsored posts or the choice of advertisers please click here. We will be reading all those comments too for feedback.